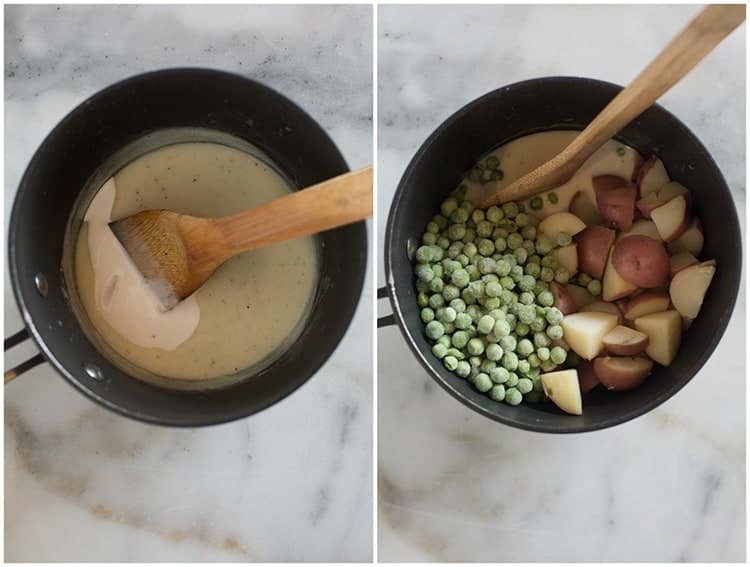 Creamy Red Potatoes and Peas is an old fashioned, classic recipe with potatoes and peas in a delicious cream sauce. It’s a wonderful side dish for any time of year. What is it about this time of year that makes me want to make all of my Grandma’s old recipes?! I’ve been hankering for my Grandma’s Oatmeal Cake, and I recently made a big batch of her traditional deviled eggs. 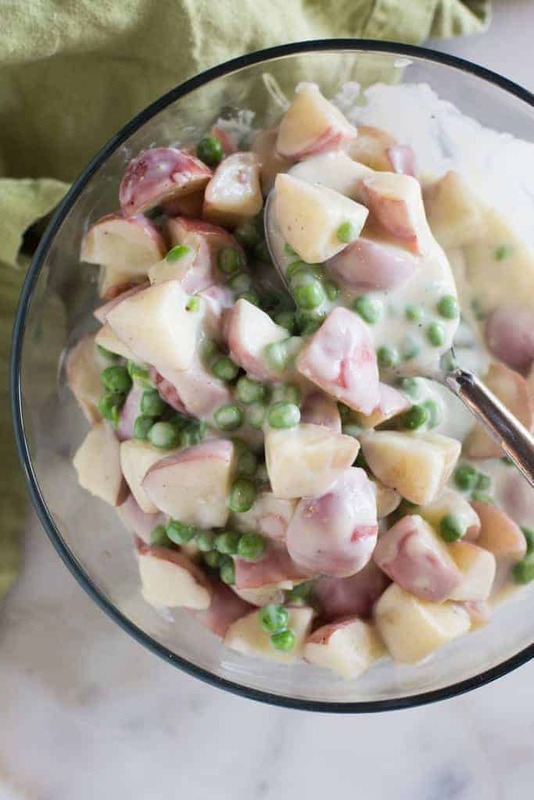 It’s been way too long since I made this classic recipe for creamy red potatoes and peas. Tell me your Grandma made this old fashioned creamed potatoes and peas recipe also? My mom calls them “new potatoes and peas” because Grandma would always make them with the new spring potatoes and peas that were fresh from the garden. This recipe is incredibly simple to make, and it’s a great side dish to so many meals, like my favorite flank steak, or baked salmon. Start with cutting the potatoes into bite-size peices, and boiling them until fork-tender. Pour the potatoes into a colander and set them aside while you make the sauce. I use the same saucepan I used to boil the potatoes. Add butter and allow it to melt over medium heat. Stir in flour and cook it for a minute or so. Slowly stir in milk. The mixture will begin to thicken. 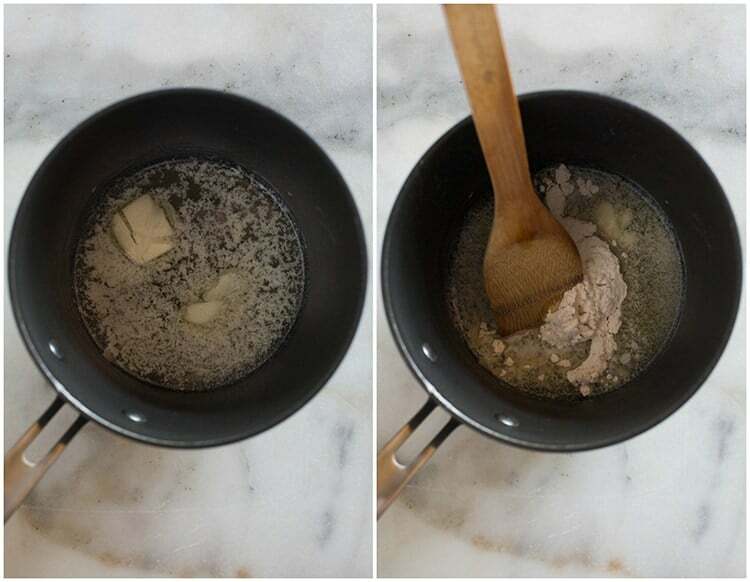 Stir in chicken bouillon paste (you could also substitute one crushed bouillon cube). Season with a little salt and pepper (easy on the salt, as the bouillon paste has a lot of salt in it). The mixture will be quite thick at this point. Pour in some cream, just until you reach a nice gravy consistency. At this point I always like to taste the sauce. Add a little more salt and pepper, or a little extra chicken bouillon paste, until it’s nice and flavorful, to your liking. Add another splash of milk if the mixture is too thick. You really can’t mess this up–just play around until the sauce tastes perfect. Then, add the potatoes and peas to the mix. I usually use frozen peas, for convenience. If you use fresh peas, you will want to steam or boil them for a minute or two, first. Give it a gently stir to coat everything in the sauce. Cook it for a few minutes to warm the frozen peas. Enjoy! This is one of those “forgotten” dishes that my husband reminded me of recently and I don’t know why we don’t have it weekly! It’s the easiest side dish and tastes amazing! My toddlers LOVED it, which is always an added bonus 🙂 . 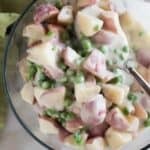 Creamy Red Potatoes and Peas is an old fashioned, classic recipe with potatoes and peas in a delicious cream sauce. It's a wonderful side dish for any time of year. Cut the potatoes into bite-size pieces. Add potatoes to a pot of boiling water and cook until fork tender about 5-8 minutes. Be careful not to over-cook them, you don't want them to be too soft. Drain into a colander and set aside. In the same pot, over medium heat, add the butter and melt. Once melted has melted, stir in the flour. Cook for 1 minutes, stirring constantly. Slowly stir in the milk, whisking the entire time, until blended and smooth. Cook, stirring, until slightly thickened. Add the chicken bullion paste and season with pepper and a little bit of salt. Stir in heavy cream until you've reached a good gravy consistency. Taste the sauce, and add more salt, pepper or bullion paste, as needed to reach a great flavor. Add another splash of milk, if needed, to thin the mixture. Add potatoes and frozen peas and stir everything gently to coat. Serve warm. *If using raw peas, they do need to be boiled or steamed for a minute or two before adding to this recipe. You could add them to the boiling potatoes water during the last 2 minutes. *This post contains affiliate links. I love sharing the products I love and use. Oh wow, all of these dishes look declicious! Now I’m starving…LOL! Lauren, I love it when people make their Grandma’s recipes! And this potatoes and peas can be a main dish or a side. So delicious! My favorite grandma used to make creamed new potatoes and peas. (She always called red potatoes ‘new’ potatoes.) It was one of my favorite dishes – so simple and comforting and it complements many different meals. She passed away fourteen years ago now. Whenever I make this for my family, I think of her fondly. I love these old-fashioned recipes! 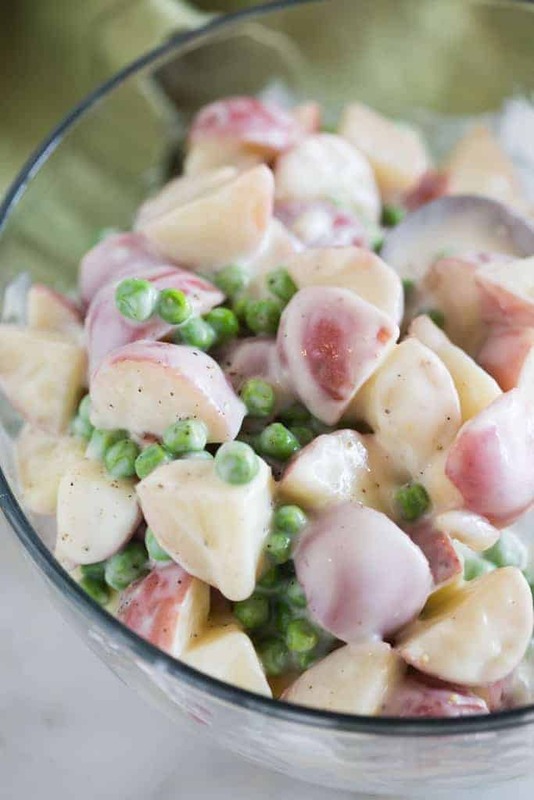 The Creamy Potatoes and Peas sounds delish. I made it and it tasted a bit bland. I added a squirt of Sriracha and it’s perfect!!! Growing up on an Idaho potato farm, we had this often. It was always a favorite of my handicapped sister. She stays with me in the winter months and I just sent her back yesterday. She called me today with her bowling scores and I asked what she was having for lunch. Yes, she told me they made her creamed peas and potatoes…in a bowling alley of all places. They have her spoiled! Oatmeal cake I make quite often. Still a favorite of mine! Old recipes are the best!! Add some fresh dill weed and lemon zest. So good.